Yacouba Sawadogo from Burkina Faso. Dakar — A farmer from Burkina Faso who popularized an ancient farming technique to reverse desertification is among the winners of Sweden's "alternative Nobel prize", announced on Monday. Yacouba Sawadogo shared this year's award with three Saudi human rights activists and an Australian agronomist. The 3 million Swedish crown ($341,800) prize honours people who find solutions to global problems. Sawadogo is known for turning barren land into forest using "zai" - pits dug in hardened soil that concentrate water and nutrients, allowing crops to withstand drought. Sawadogo said he hoped he would be able to "use the award for the future". "My wish is for people to take my knowledge and share it. This can benefit the youth of the country," he told the Thomson Reuters Foundation by phone from his village in Burkina Faso. 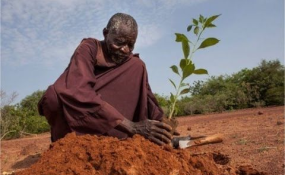 "Yacouba Sawadogo vowed to stop the desert - and he made it," said Ole von Uexkull, executive director of the Right Livelihood Award Foundation. "If local communities and international experts are ready to learn from his wisdom, it will be possible to regenerate large areas of degraded land, decrease forced migration and build peace in the Sahel." Sawadogo initially faced resistance for his unconventional technique, based on an ancient method that had fallen out of practice. Now "zai" have been adopted by aid agencies working to prevent hunger in the region. Sawadogo told his story in a 2010 film called "The Man Who Stopped the Desert".